… never let it be said that I can’t make a good one! The task was not so hard. Not really. I simply needed to wind a hank of Socks That Rock into two balls. Usually I do that at home with my low-tech equipment (nostepinne and chair). Today I decided to wind at Tangle Knitting Studio because Alice has a yarn measure so it’s easy to tell when 1/2 of the yarn has been wound. I have wound yarn there before. Really. But the yarn measure thingy is a little new to me. It turns out that when the yarn goes through the measure thingy, the balls are wound sort of tight. I also had some problem with the ball winder coming un-anchored and falling on the floor. And I no sooner got that picked up and re-anchored than the center thing that the yarn winds around fell off with my ball on it. Needless to say that the first ball was a little strange looking. I decided to rewind it. I pulled on the center end, and it stuck. So I pulled a little harder, and the ball started to fall apart. Someone else needed to wind yarn, so I moved over out of the way and started trying to untangle my yarn. And it got worse, and worse, and worse. At one point I actually had the yarn tangled through the slats on the back of a chair. I have no idea how I did that. I was afraid I would have to take the chair home. I told Alice I hoped she didn’t mind too much staying open for a little longer than normal. When it became clear that my ball of yarn was becoming increasingly more tangled, I began to press other Tangle (oh what a now-appropriate name that is!) 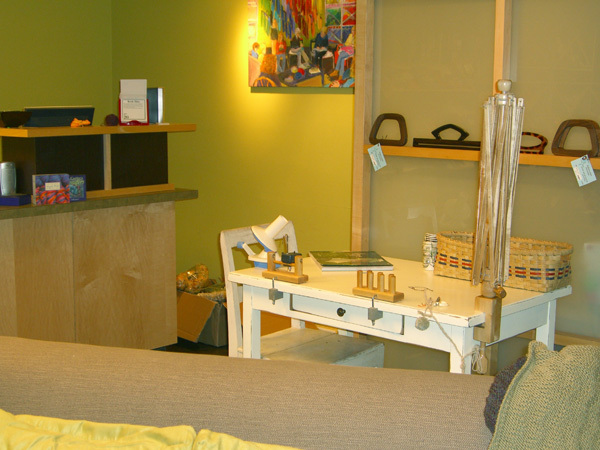 visitors and customers into service. Eventually there were three of us untangling different portions of the yarn while Alice tried to wind it with the ball winder. Alice was only semi-successful because the part she had was so tangled. But when the other end of the yarn was finally located and freed, and the chair was unchained, and we began to get a little bit of control back, I started winding the yarn on to the swift. Then it was down to myself swifting and Alice untangling, and we finally got it back on the swift. From there I could wind it using the ball winder, and bypassing the measure. I wish I’d thought to take a picture of us all hysterically untangling yarn. It’s amazing how tangled 500 feet or so of yarn can get. But I did not think to stop and grab my camera, so you will have to be content with pictures of my Tipsy Knitter socks, which I finished this morning. 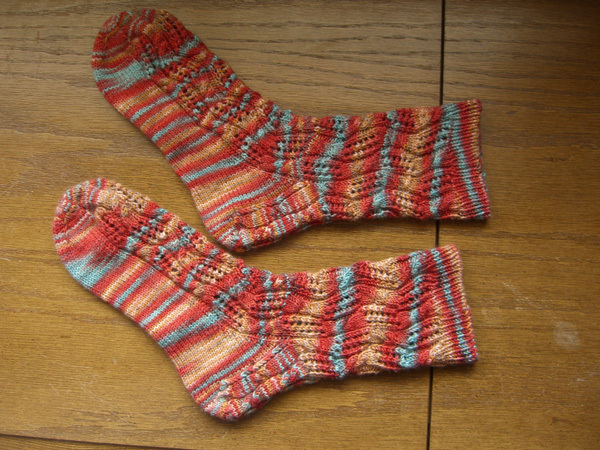 And here are the finished socks after washing and blocking. They are a bit fraternal. But, strangely enough, if I hold my legs together the diagonal stripes on one leg meet the diagonal stripes on the other leg. There’s a couple of splotches of pooling, but both are under the foot, so who cares? I love their red rock stripy-ness. I think it fits the leaning ladders and cables perfectly. 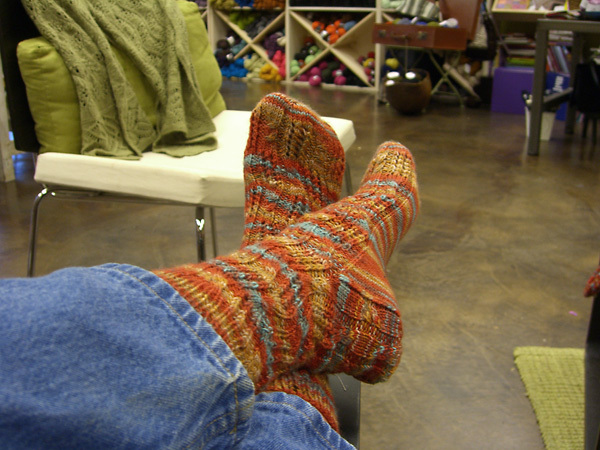 The stitch pattern is called Tipsy Knitter in the Socks Socks Socks book and Tilting Ladders in Barbara Walker’s Second Treasury of Knitting Patterns. I used the pattern more as an inspiration than actually something to follow. Changes made: I knit toe-up instead of top-down. I used a star toe. I ribbed the top instead of using cables. I didn’t think the cables would hold the sock up as well as ribbing. You can see from the pictures that the socks fit pretty good. They are a little big, especially in the toes. But I think washing without blocking will help them to pull in a little tighter. They certainly fit a lot better than I thought they did on the night that I almost frogged them out! And what am I doing with the yarn I was tangling up winding today? Ah… it’s something of an experiment. I will post pics if it works out.